"The RMI curriculum has provided me with exceptional technical skills through rigorous practical application. The industry-focused curriculum has allowed me to present case studies to industry executives both in the United States and internationally, allowing me to develop confidence and presentation skills. I have also been able to experience firsthand the operations of the Bermudan reinsurance market and attend countless industry conferences. I graduated from the program with an extensive global network of insurance professionals, including the leaders of the insurance industry's largest organizations. 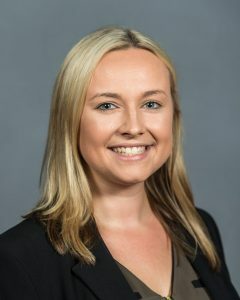 As I begin my career as an Actuarial Associate at PricewaterhouseCoopers, I feel that the RMI curriculum has strongly prepared me to handle the pace and demands of consulting." 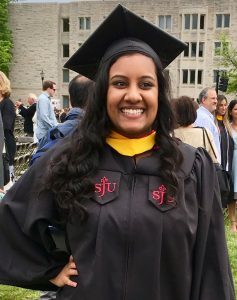 "As an alumni, I am incredibly grateful for my time in the SJU RMI program. The Saint Joseph’s RMI program is the place where professors become mentors, and peers become a network of colleagues, as well as of life-long friends. The technical knowledge we learn in the classroom, combined with the networking and presentation skills we learn throughout the program allow us to graduate not only with a job lined up, but ready and prepared to succeed in all that lies before us, both personally and professionally. I truly believe it is a combination of the Jesuit teachings, the ownership the faculty takes in the success of its students, and the unprecedented industry exposure and support that has earned our program the #1 ranking in risk management and insurance programs in the country." "My experience in the St.Joe's RMI program gave me the knowledge, skills and credibility to be able to land a job, where I am the first college hire, in a highly specialized Nuclear Energy Insurance Company. In just the first month at my new job, I quickly realized how complex the organization and the products are, but as overwhelming as it was, I also felt incredibly prepared. The St.Joes RMI program gave me so much knowledge that I am able to keep up with seasoned underwriters and I have no doubt that the skills I have learned will only work to propel my growth in the future!" 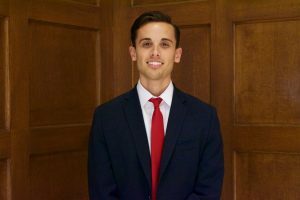 "After choosing my major my sophomore year, I began to recognize all of the wonderful opportunities Saint Joseph’s University and the Finance department created for me. Not only are the professors within the Finance department extremely helpful and supportive, but they have assisted me in my classes first hand and have given me a broader knowledge within the world of Finance. This summer, I lodged an internship with Comcast Spectacor as an Accounting and Finance Intern for the Philadelphia Flyers sports team. Through this internship, I have gained valuable experience and knowledge within the global world of Finance. I began applying all that I have learned within my Finance classes to real world situations for a widely known popular sports team." 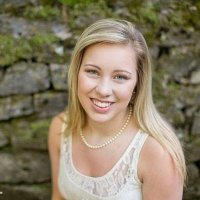 "Being a Finance major has helped me understand the finance industry. The various courses including electives such as real-estate and student managed funds help students study what they have an interest for. The Finance Department has connections to many internship and job opportunities. Overall, all of the courses and the continuous support from the Finance faculty prepare students to be successful and excel in their chosen career path."